I started sketching back in architecture school at UT Austin where drawing was (and still is) an important part of an architect's education. In my 3rd year review, 2 professors wrote I had "weak graphic skills" -- honestly, I think that comment only made me work harder to learn to draw. That struggle also became my inspiration for teaching drawing and perspective sketching--10 years at Parsons School of Design in NYC, briefly with Gail Wong and Frank Ching at UW, and more recently for a number of years at Cornish College of the Arts where I now teach a perspective field sketching class. I have also taught sketching classes to architecture firms here in Seattle. Although I got my architecture license while living in New York, I have spent most of my career as an architectural illustrator (www.stephaniebower.com) and have had the good fortune to work with many wonderful offices. Although digital imagery now dominates the profession, I believe hand drawing is still an important design and communication tool. I truly hope it won't disappear. Last year I made 2 sketching trips abroad-- one to southern Spain and a second to India/Nepal, where I filled 2 large moleskin watercolor books (you can see a few of the pages on my flickr site at http://www.flickr.com/photos/83075812@N07/. ) 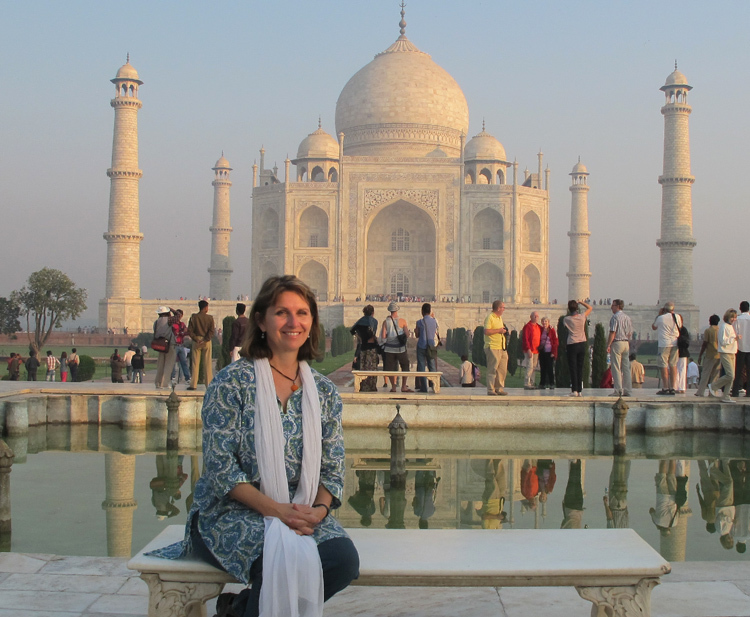 India was amazing, but it's a very challenging place to draw. Simply opening a sketchbook literally brings people running! I hope to continue traveling and "seeing the world one drawing at a time" -- it is truly my passion. I'm also exploring watercolor landscape painting and have had work in a few shows. If you are interested in watercolor, the Northwest Watercolor Society is a great resource. As for personal info, I Iive in Seattle, am married to an architect and have 2 sons, one at Garfield High School and one just starting UW. Even though I draw quite a lot, I feel that I still struggle with my field sketches. It's so hard to master all the variables. The energy and support the Urban Sketchers give each other, in person and on the websites, is amazing. What a brilliant concept. This group is helping to keep hand drawing alive in a digital age -- around the world, no less! The image I am posting is the one I'd grab if the house caught on fire (OK, I'd grab the India sketchbooks too.) 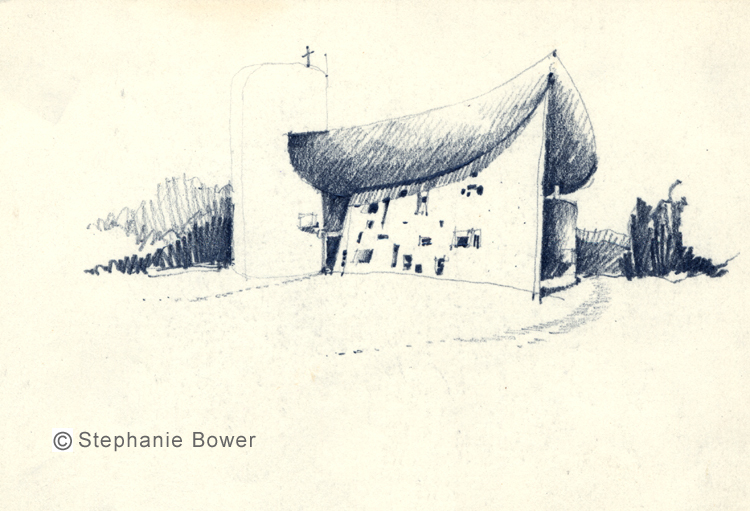 I spent my 25th birthday here at Le Corbusier's cathedral at Ronchamp. Although that was LONG ago, it was the magical day my drawing abilities came together. So this is my first post as an official blog correspondent -- thanks so much, and see you at the crawls! Glad you've joined. Look forward to seeing more of your sketches. Welcome, Stephanie! Loved your intro!